You could not have ordered up weather any better for this week as temperatures were 70 to 77 degrees with very little rain and having a few cloud-covered days. The fishing was absolutely fantastic with all species being caught in numbers and size. Ron & Lisa Vincent from Sherrills Ford, NC returned for their 18th visit with us at Fireside Lodge. 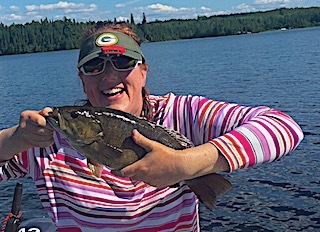 DOA they wasted no time Lisa catching a HUGE 19-inch Trophy Smallmouth Bass and Ron landed 3 Trophies over 18-inches. 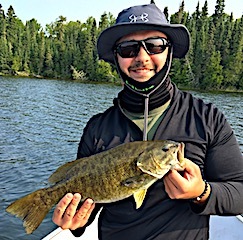 1st day was a portage to Closs Lake catching a Muskie, several big Smallmouth Bass in the 17 to 18-inch range and Ron landed a Master Anglers Trophy Smallmouth 18.5-inches. 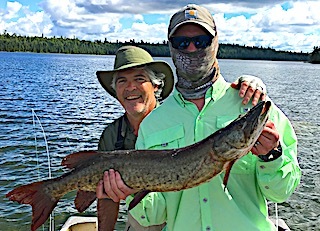 2nd day was catching plenty of Smallmouth Bass & Northern Pike and Ron came up with the BIG Fish of The Day catching a 38-inch Muskie. After supper Ron fishing solo caught a 37-inch Northern Pike. 3rd day Ron lost a BIG fish and his favorite deep diving Yo-Zuri but the day got better as he caught a 19, and two 18-inch Trophy Smallmouth Bass plus Lisa and Ron caught a bunch of Northern Pike. 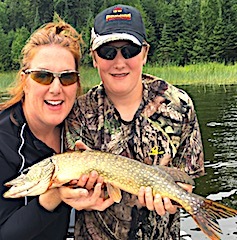 4th day Lisa took the day off fishing so Ron fishing solo caught some nice Smallmouth Bass, hooked and lost a big Tiger Muskie and caught 2 big Northern Pike 37 and 38-inches. 5th day Ron caught a 30-inch Muskie and had a big Muskie on that rolled at the boat and broke him off. They also caught several Smallmouth Bass and Northern Pike. 6th day they caught so many Smallmouth Bass they lost count one being 18-inches plus 4 Northern Pike 30 to 36-inches. 7th and final day they caught 8-10 Smallmouth Bass between 16-17.5-inches and tons of Northern Pike. Both had a fabulous stay and upon departing Ron said he would be in touch very soon to make next years reservation. Eric Hess from McLean, VA returning for his 3rd time brought his son Culley for his 1st ever Canadian Wilderness Fishing Adventure. 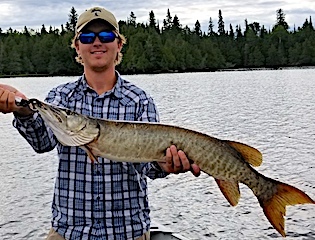 1st day they caught 75 Smallmouth Bass up to 17.5-inches and Culley landed a big 35-inch Northern Pike and his 1st ever Muskie measuring 30-inches. 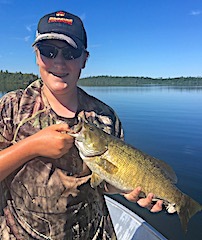 2nd day they had a super day Smallmouth Bass fishing catching over 100 fish with many 15 to 17.5-inches & Eric came up with a terrific Trophy Smallmouth Bass measuring 21-inches. 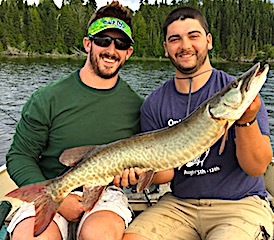 In addition they caught some Pike up to 32-inches and Eric, while fighting a Smallmouth had a Muskie T-Bone the bass and they were almost able to cradle the Muskie with the bass in its mouth. Eric stated that it was the best fishing day of his life. 3rd day was another very good day Smallmouth Bass Fishing catching over 40 fish many 16 to 17.5-inches and Culley caught 2 trophies at 19 & 19.5-inches and Eric had one measuring 19.5-inches. 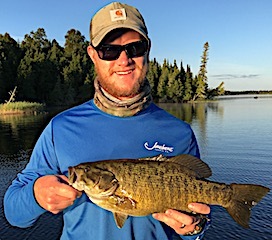 4th day was another great Smallmouth Bass day with Eric landing 2 Master Anglers Award Trophy Bass at 19.5 and 19-inches and Culley had one measuring 18-inches ending up with 40 fish each. 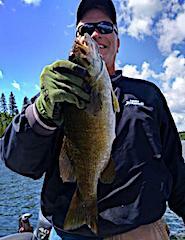 5th day was a bit slower but they still caught many Smallmouth Bass with Eric landing another Trophy 19-incher. 6th and final day they portaged to Closs lake catching a lot of Smallmouth Bass up to 19-inches and a nice Muskie. 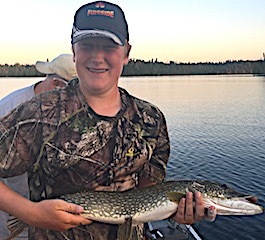 After leaving Closs and fishing Little Vermilion Lake they caught a nice 35-inch Northern Pike and Eric hooked a MONSTER Muskie, getting to the boat after a long fight but it was lost in the netting process. Eric was estimating it to be in the upper 48 to 50 inch range. This concluded what Eric described as an epic fishing trip between father and son making memories to last a lifetime. Ken Heyse Auburn, IN son Kenny and his son/grandson Garrett from New Hartford, CT were fishing at Fireside Lodge for their first time. 1st day was great catching a bunch of fish both northern pike & smallmouth bass. 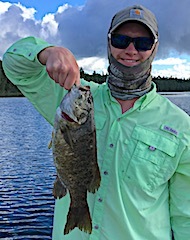 2nd day was a super day catching both Northern Pike & Smallmouth Bass most being bigger fish, and Garrett caught the biggest fish landing a HUGE 21-inch Trophy Smallmouth Bass. 3rd day these three had another good day catching Northern Pike, with Ken Sr landing the largest at 33”, and then they caught many Smallmouth Bass on blue fox spinners and a Yo-Zuri suspending twitch bait. 4th day was a slower day which all fishers get. 5th and final day they got into some nice Northern Pike and for lunchtime decided to visit Twin Falls to see this natural wonder. They thoroughly enjoyed their stay making special memories between three generations all saying that they would love to return. 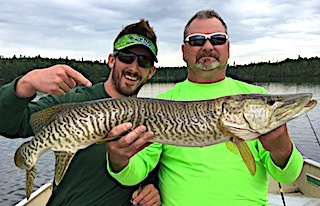 Long time guests returning for their 15th trip were Tyler Tennant from Lakeway, TX with father-in-law Pete Higman from Libertyville, IL and were they glad to be back to chase the long toothy critters. 1st day the caught a lot of Northern Pike in the medium size class. 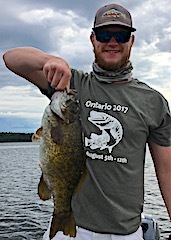 2nd day was a portage for Muskie & Smallmouth Bass catching both with Pete having the hot hand for Muskie landing 2, and Tyler landed a 19-inch Trophy Smallmouth Bass. 3rd day they had a lot of big follows and caught a lot of smaller to medium size Pike. 4th day they caught a lot of Northern Pike plus Tyler caught two more Master Anglers Award Smallmouth Bass measuring 18.75 and 18.5-inches. 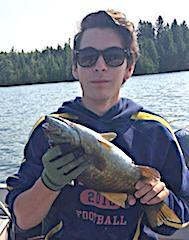 5th day had them catching Pike, and Tyler caught two Muskie largest being 33-inches plus two more 18.5-inche Master Anglers Trophy Smallmouth Bass. 6th & final day they did well catching Northern Pike and were able to end their trip with Pete catching a Muskie. Before leaving there was chatter about next years trip, Tyler making their reservation for 2018 the day after returning home. First time guests Mike, Polly, & Joe Charbonneau from Mechanicsburg, PA were very excited to arrive. 1st day was great for it being their first time ever on Little Vermilion Lake, catching 20 Smallmouth & 2 Pike. They said most of the fish were bigger than any fish caught on previous fishing trips to Canada. 2nd day was great catching 17 fish, 5 Northern Pike and the rest were Smallmouth Bass. 3rd day was a great day catching another 20 fish, 17 of which were Big Smallmouth Bass 16 to 17.5-inches. 4th day these three had the fishing day of their lives catching over 30 Northern Pike with plenty of misses, and Joe also caught his first ever Trophy Smallmouth Bass measuring 18.5-inches. 5th day was terrific catching 33 fish, 30 being Northern Pike an Polly caught 2 Trophy Smallmouth Bass measuring 19.5 & 18-inches while Michael caught one at 18-inches. They said the Smallmouth were bigger than they ever saw before and were amazed at their girth. 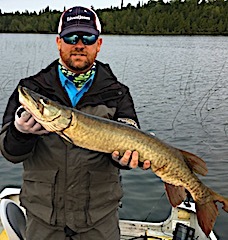 6th and final day was a terrific end catching 25 Smallmouth Bass with a lot being 16 to 17.5-inches, 3 Northern Pike and a Muskie encounter of the third kind. 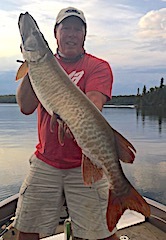 With 15 minutes of fishing time left on their last evening Mike had a HUGE Muskie grab a fish he was in the process of catching, and the Muskie paraded around with the fish it’s mouth for all to see before spitting it out and casually swam away. This was a fabulous way to end an amazing family fishing vacation making memories for years to come. Long time guests from North Carolina Leon Robbins, Yadkinville, son Andy Thomasson Cary, Justine Sebastian Gastonia, Troy Reed from Winston-Salem, and for his 1st experience Houstin Butler from Jacksonville, FL. were all thrilled to be back fishing at Fireside Lodge. DOA was fun with all catching fish. 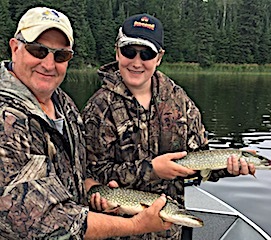 1st day was a morning trip into Cedarbough with Justin catching two Muskie then they fished for Northern Pike & Smallmouth Bass doing well until about 1PM except for Leon & Andy as they caught over 50 Northern Pike in the afternoon. 2nd day Andy started his day before breakfast with a nice Muskie, Troy got on the board with a Trophy 18.5-inch Smallmouth Bass, and Houstin caught his first ever Muskie plus a Master Anglers Award Trophy Smallmouth Bass measuring 18.5-inches. 3rd day was an excellent day for Troy and Andy as they focused on their fishing style which was using Buzz Baits catching countless Northern Pike and having equally as many misses. 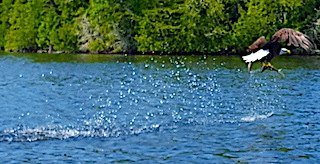 They said it was a blast watching these pike skyrocket out of the water after their lure. 4th day was another great day catching a mix of Smallmouth Bass and countless Northern Pike. 5th and final day all caught plenty of fish but also took it a little slower to enjoy their final moments in our wonderful wilderness atmosphere before having to return to the hustle and bustle of city life. Michael Heath New London, NC returned for his 1t5 time with his son Tyler from Mount Gilead, NC and for his 2nd trip son Walker. DOA they caught fish with Michael getting off to a bang up start landing 2 trophy Smallmouth Bass measuring 18.5 and 19-inches. 1st day all caught fish and Walker had the catch of the day landing an 18-inch Smallmouth Bass. 2nd day Tyler caught a 19.5-inch Trophy Smallmouth Bass first thing in the morning and, then Michael, Tyler, and Walker caught a total of 63 Northern Pike during the rest of the day. 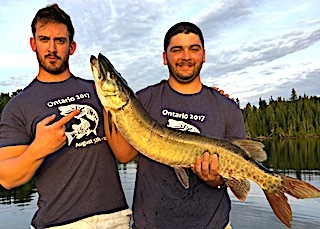 3rd day was focused totally on Muskie fishing and these three had a fabulous day landing 4, Walker catching two at 37 and 38-inches and Michael had the catch of the day landing a 40-inch Tiger Muskie. 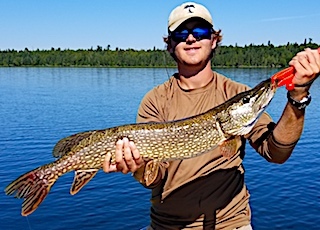 4th and final day was all about Northern Pike catching well over 70 to end their trip on a high note. All had a great time and for Michael it was all about the wonderful memories he made with his sons Tyler & Walker. Returning for their 13th visit were Kent Williams & Bill Black from Brookhaven & Atlanta, GA. 1st day the fish were not as cooperative as they liked but they did catch Northern Pike with Kent catching the largest at 33-inches, but Bill took the two largest Smallmouth Bass at 17.5-inch and a Trophy 18.5-incher. 2nd day was a good day catching many Smallmouth Bass with a mix of sizes up to 17.5-inches along with a few Pike. 3rd day Bill & Kent had a good day by really had to work for the fish they caught. 4th and final day had them catching some fish, but being a bright blue bird day made it a more challenging fishing day. As they say that’s fishing and both Kent & Bill understand that. 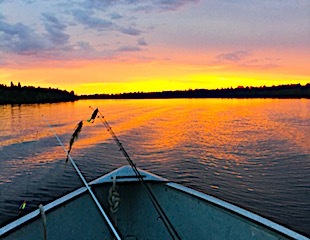 Being back in the wilderness fishing again rejuvenated them, and as well as I know Kent he is already planning for the next time they return. Long time return guest Brad Sammons from Indianapolis, IN was glad to be back with his two sons Ryne and Braden. DOA they took advantage of the calm conditions and caught a lot of nice Smallmouth on surface poppers. 1st day they again had a ball catching Smallmouth Bass on the surface with poppers, caught some Northern Pike and saw a few Muskie follows. 2nd day the tooth critters were sparse getting some follows, but they again enjoyed surface fishing for some Big Smallies. 3rd day the caught a bunch of Pike and a few Smallmouth Bass while searching for that big Muskie, seeing some nice follows but no takers. They also caught some good smallmouth bass on the surface. 4th day was a really good day catching a lot of bigger Smallmouth Bass having a few trophies between 18-19-inch, some Pike were caught and Brad said the Muskie were moving, seeing a number of good follows. 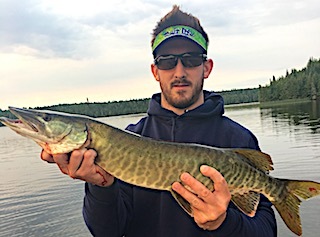 That evening after sighting a fish surfacing Brad threw to it, and it slammed his surface lure, The Psycho Sister, and he landed a 39-inch very healthy Muskie which was a great finish to a great day fishing with his sons. 5th and final day was spent catching Smallmouth Bass and seeing some Muskie follows but no takers. The best catch of this trip was making memories between a father and two sons fishing which they have been doing on this annual fishing trip since Ryne n& Braden were about 10 years old. Thanks for choosing Fireside Lodge to spent this special time together.